Check out our new website at love-rocks.org for a full tutorial and video of how to make and share Love Rocks. Sometimes life brings circumstances that are completely out of your control. In those times, it’s important to remember the beauty in life, love, and knowing that God can — and will — bring a peace that surpasses all understanding. Love Rocks was inspired by two girls who lived with immense Love and Joy. In their honor, we have chosen to share that Love and Joy with anyone willing to receive it. Thank you for celebrating with us! I have had a beautiful life filled with lots of laughter, smiles, lots of love, beautiful children, a wonderful dedicated and loving husband, solid friendships and a community that loves and supports their neighbors unconditionally. On Oct. 20, 2013, the unthinkable happened to my family. My daughters, Anna (6) and Abigail (11) were hit by car in front of our house. Both girls went to Heaven that night without warning. Tom and I have had to navigate grief that we wouldn’t wish upon anyone. Our house is now empty – no laughter, no dance parties, no morning cuddles, no fighting about homework or bonding over our favorite meal. Empty. We decided shortly after the girls went to Heaven that we were not going to allow the tragedy of one night to define our girls’ lives here on earth and the life they were now living in Heaven. Their legacy would not be this tragedy but rather the love and joy that they poured out to everyone who knew them and hopefully everyone who would hear their story. We did not have choice on whether they went to Heaven on October 20th. We do, however, have a choice on how we live our lives honoring our Creator and honoring the lives of our sweet girls. We choose Love and Joy! Anna’s and Abigail’s lives were full of so much love and so much joy. They had a way of lighting up a room with their presence and putting smiles on the faces of those they came in contact with. They loved each other dearly and they were definitely sisters – maybe not by blood, but by the way they knew exactly how to push each others’ buttons. Anna adored her sister and wanted to be around her all the time. Abigail loved her little sister and was annoyed by the fact that Anna wanted to be around her all the time. True sisters! Anna loved horses, Abigail loved theater. Both girls loved to dance, climb, be with their friends and loved family time. They would prefer a game as a family over a movie any night -LIFE, UNO and Jungle Speed being their all time favorites. They were beautiful beyond words, both on the outside and more importantly on the inside. They had giving hearts and loved to find ways in which they could help those in need. They were insightful, kind, nurturing and loving to all who had the honor of being in their presence, especially their friends. In April of 2014, 6 months after the girls went to Heaven, Tom and I felt nudged to share a project that we as a family did for our wedding in June of 2011. The girls, Tom’s mom and I spent time cutting out fabric hearts from our favorite fabrics and then Mod Podging them to river rocks. We made one for each of our guests to take home and another one that would be written on by our guests for us to keep. These little rocks have held a lot of meaning in our house since our wedding day and are placed in various rooms so that we can enjoy them no matter where we are. That little nudge to share took on a life of it’s own. On April 20th, I launched the Facebook Page, Love Rocks. I shared a bit of our story and our hope for spreading Love and Joy through these simple rocks and included a tutorial for how to make them. Before pushing publish button, I had to come to terms with the fact that nothing may happen with this little idea of ours. I took a deep breath, said a prayer, and sent our idea out into the world. What has happened over the past 16 months has been miraculous. Love Rocks have been shared in our little town, our state of Oregon, in neighboring states and in every other state in the U.S. Love Rocks have been shared in Africa, Asia, South America, Europe and Australia and even Antarctica. There are photos of Love Rocks in parks, on beaches, on The Great Wall of China, in front of the Eiffel Tower, on doorsteps, in hospitals, at weddings and at funerals, in a secured NASA facility and at Anna’s and Abigail’s tree. There have been so many stories of how these little rocks with fabric hearts have found their rightful owner just when they needed it most. They have warmed hearts and brought so much Love and Joy to this world — so much more than we could have ever imagined when we felt nudged to share. The inspiration for Love Rocks comes from Anna, Abigail, and our loving community that supported us and continues to care for us. The outpouring of Love and the immense Joy that is felt throughout the world is their legacy –one filled with hope, light and laughter. My girls lives were and are beautiful. They have taught so many how to live a love story and I am very proud to be their mom. Check out our website for at love-rocks.org for a video tutorial. To get involved find or make a Love Rock and spread love and joy. Give the rock to someone while doing an act of kindness for them, place the rock somewhere special for someone else to find or simply give the rock to someone and just let them know they are loved. You can write a little message on the back or just leave the heart to say it all. I smile at the thought of those who find them. So, if you feel moved to join me in spreading love, get out your Mod Podge and go to the dollar store and buy a big bag of rocks and some fabric. 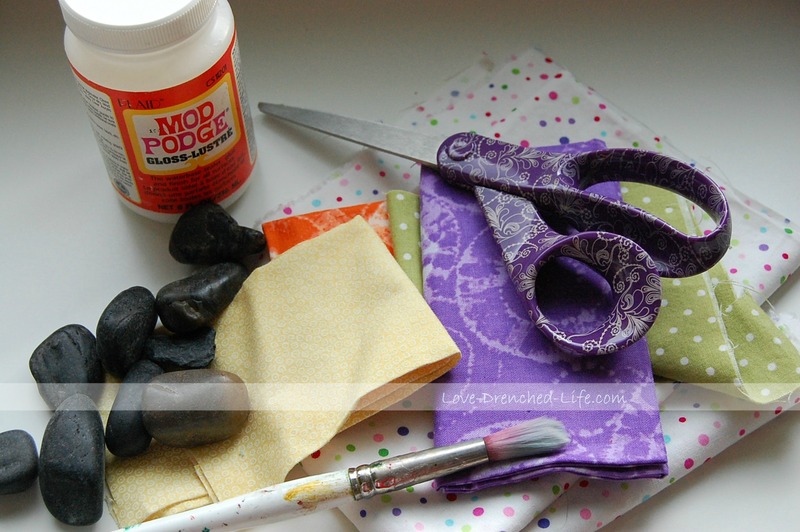 Supplies Needed: mod podge, small rocks, fabric, scissors and paint brush. 1. Cut fabric hearts 2. Paint mod podge onto top of rock. 3. Place heart on rock and paint mod podge over entire top of rock including fabric 4. Write or mod podge a tag (found at the bottom of this page) on the back with love-rocks.org so people know they found a Love Rock 5. Share Love and Joy! After giving or receiving a Love Rock, log onto http://www.facebook.com/lovedrenched and share your story or pictures of your creative placements. ~ Where can I buy a Love Rock? A finished Love Rock is not something you buy but rather make on your own or find. ~ When I find a Love Rock can I take it with me? Yes, Love Rocks are something that is put out into the world for others to find. Some people like to take them, others will take a photo and leave it behind for someone else to find and some just like to feel the love that was left and then leave it for others. ~ When I place a Love Rock how can I guarantee that will be posted on the Facebook page? Unfortunately there are no guarantees on whether or not your Love Rock will be posted on Facebook when found. You increase your chances if you make sure to let people know about the Facebook page by either putting it on the back of the rock or leaving one of the cards (found below in Love Rock Resources). ~ Where can I buy the supplies for Love Rocks? Best place to buy polished rocks are at the Dollar Tree, you get a bag of 20 for $1. All the other supplies can be found at Walmart, Joann Fabrics or Michael’s. ~ What is the best way to cut out the hearts? I have found the best way to cut out hearts is to cut your fabric in 1 inch strips and then fold it long ways. I then, with a very sharp pair of scissors, cut half of a heart on the fold. I can cut a lot of hearts out of one strip of fabric and once I get going it moves along rather quickly. Having sharp scissors really helps. ~ Where can I buy a Love Rock kit? You can buy Love Rock kits and other handmade items at our online store at lovedrencheddesigns.indiemade.com. All proceeds of sales will go to the Anna and Abby Memorial Fund which will fund the memorial playground built in their honor, Anna and Abby’s Yard. ~Where can I buy a Love Rocks t-shirt or hoodie? We have decided to use a fundraising t-shirt company called Teespring. Log on to their site, teespring.com/loverocks or teespring.com/loverockskids, and you can order a t-shirt or hoodie. We have raised over $7,000 for Anna and Abby’s Yard from our Teespring campaigns. Wear the love!! ~ I love this idea and would like to start my own Facebook page for my community, do you mind? I have been asked a number of times, with good intentions, if people can open a separate Love Rocks Facebook page specific to their community. I would ask that you don’t do this for a couple of reasons. Love Rocks are not community specific but rather travel across communities, states and even into other countries. I have gotten post from people who have traveled to Oregon, Las Vegas, Virginia and even Mexico (just to name a few), found a Love Rock and then went back to their hometown and shared it with someone else. Opening up other sites would confuse people and also would make it difficult to track Love Rocks that travel. Second, this site means a lot to me and I love reading all the posts and messages of how Love and Joy are being spread by these little rocks with fabric hearts not them. It’s what I have and I know that my girls have a hand in all this love and joy. ~ When Love Rocks post on the Facebook page or when I send a personal message to the Love Rocks page, who am I sending it to? I am the only administrator for the Love Rocks page at this time so when you see a Love Rocks post it’s from me, Susan (Anna and Abby’s mom). If you have a question that you don’t see here don’t hesitate to ask. LOVE-ROCKS.org To use on the back of Love Rocks! LOVE ROCKS :FB To use on the back of Love Rocks! My husband found a love rock while walking on the beach in Lincoln city on mother day 2017. Irene ~ yes, feel free to copy the Love Rocks story and connect anyone you want to our Facebook page Love Rocks and also the website love-rocks.org. Good luck with your event and thank you so much for sharing love and joy!! Irene I also need to add that Love Rocks are very specific as they are river rocks with fabric hearts mod podged onto them. You can find our tags for the back of each Love Rock on our website ❤ let me know if you have any questions. Ready to start, any suggestions to get me going? Michelle..head over to our Love Rocks website love-rocks.org and it will give you all the info you need to get started. Don’t hesitate to ask questions and happy Love Rocking ❤ Welcome to our community of sharing love and joy! This is such a wonderful act and honor for your beautiful little angels. My husband and i were on a walk in Yoncalla Oregon a couple of years back. I found one of the love rocks that day in February, not knowing what it was all about but it was special to me. I kept it and had put in with my Valentine decorations. When I took out my decorations this morning I saw the #loverocks on the back, looked it up and found this page. I love the message and will be making some to spread the message with my Granddaughters this summer. Thank you for sharing, your angels must be proud. Your project has impacted our community a great deal!! We have a website at NPR ROCKS and alot of people post the ones they paint & find there! Awesome idea!! Check out our site to see what you started, it was even on our local news this morning!! I am a member of NPR Rocks also. I am going through an extremely difficult time in life right now..these rocks have brought me a lot of much needed peace and joy. Now that I know how it began it is even more special to me!! I was gifted with a love rock yesterday!!! I work at an Italian Deli in Manchester, VT and these two delightful Lady’s sat in the back of the room next to the window. When they finished their lunch, and parted the deli, I went to clear their table. I noticed something black on the table. Thinking one had left their keys behind like so many do, I went to grab the object to run and catch the ladies but to my suprise I was holding a love rock!!! I thougt it was cute. It’s the little things in life we have to find joy in!!! It reminded me of all the pet rocks my son would give me when he was a toddler!!! Then I looked up love-rocks.org when I got home. WOW!!!! What a powerful message!!! I truly feel blessed that these ladies left me a part of something so much bigger than I had even imagined. Some things have been happening in life that have been making me feel uncertain but after yesterday, I know everything’s going to be ok!!! I would love to thank the ladies that left me the love-rock as they didn’t say a word except with great joy…You have a wonderful day as well!!! So if these ladies happen to read this….Thank you from the bottom of my heart and God bless you both!!! It really is the little things in life that we all need to enjoy!!!! Hi! I am glad that you loved your “Love Rock” and I am glad that it helped to brighten your day! Thank you for serving our food and taking care of us. I learned about Susan’s story three years ago through a dear friend, who lives in Oregon. When we had a tragedy here in town I was moved to start making Love Rocks and I have been addicted to sharing Love and Joy ever since. Susan’s heartbreaking story reminds me that love WINS, even when are heart’s are broken to pieces. I work in Manchester at Family Footwear Center on Tues. and Wed. and we have a dish of Love Rocks at the counter, if you ever want to stop in and pick up more love and joy. Thoughts, prayers and hugs, Gretchen L.
Susan, I am saddened by the loss of your girls. As a Mother of a dear little one in heaven too, I love this idea! I have slowly been trying to define my life and have chosen to use the phrase ‘leave a heart print everywhere I go’. As I pondered what to put on my decorated rocks for spreading joy (Vancouverocks.com), I thought heart prints of all types would be just the right thing. I came across your site and it feels so close to what I want to do that I need to know if it would be ok to do a few of your love-rocks too along with my own style. I hope it won’t offend you in any way, I just want to spread as much love and joy to as many people as possible. Thank you so much for your message. I am so sorry for your loss…I hate that we both know this pain ~ I hate that anyone has to know this pain. Love Rocks are river rocks with fabric hearts mod podged on them and are Anna and Abby’s legacy of love and joy. I have no problem with others sharing in the project and making their own Love Rocks to share but I do ask that you direct people to our website (using our website or Facebook page) to understand what they have found and the meaning behind it. Some people with use a # under the website to remember their loved one…but I do ask if you make a Love Rock that you put the info on there. There are a lot of rock projects out their and they all do amazing things ~ Love Rocks is Anna and Abby’s legacy and I am so proud of them and what their love and joy has done both when they were here and now that they are in Heaven. Love and prayers to you ❤ Let me know if you have any questions.